As a hobby runner who isn’t getting any younger, I am constantly concerned about injury. At the same time, however, I frequently am too lazy to anything other than run. However, I really wanted to give my all for Grandma’s Marathon, so decided I would do some of the little things that might help me. 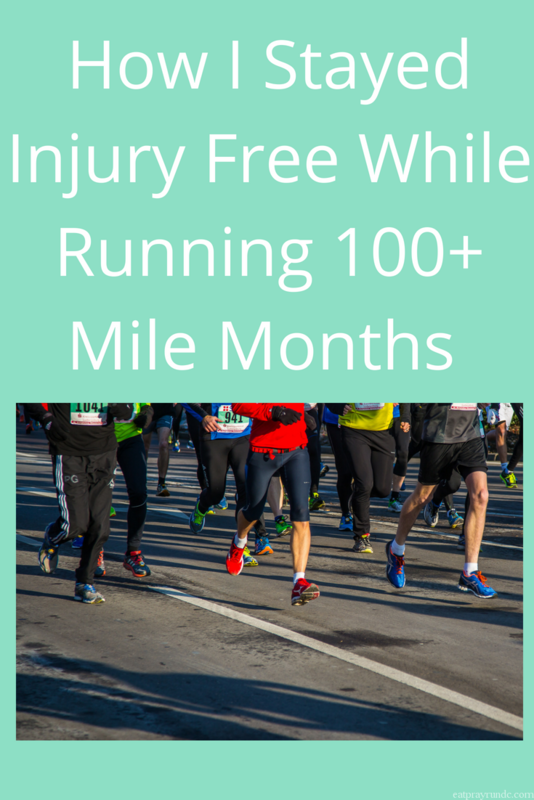 I wanted to share how I stayed injury free running multiple 100+ mile months. I ran almost 800 miles between January and May of 2018. That was definitely the most mileage I had ever run in five months time and while it felt hard (and I was tired), I was able to stay injury free. Here are my tips on how I stayed injury free running relatively high mileage for multiple months in a row. Foam Rolling. I have always been inconsistent with rolling but really committed to trying to roll daily. That meant in practice I rolled most days of the week. This definitely helped to keep small knots from turning into big issues. Core Work. This has been incorporated into my plan this training cycle and I definitely think it has helped just make me stronger overall and therefore keep injury at bay. Massages. This was definitely new and helped a great deal. I started feeling ankle pain about halfway through this cycle. I went to a massage therapist at my PT’s office and have since gone every two to three weeks. It has helped SO much. What I thought was tendinitis was actually tight ankles due to massively tight calve muscles. Seeing my fantastic massage therapist lead to number four, below. Warming Up. I am embarrassed to admit that my normal routine consisted of waking up, using the restroom, letting my dog out and then immediately heading out the door to run. I knew better, but it took my massage therapist telling me that doing that was going to cause injury to make me change my act. Now I have a simple routine – I do some stretching and calf raises while I’m getting ready in the restroom and then I do a quick series of dynamic leg swings outside before I take off. It’s not a ton but this five minutes or so really does make a difference. Collagen Peptides. I did a bit of research surrounding the science on this and am not convinced totally…but I will say that I’ve been taking collagen peptides for over a month and I think they have helped my recovery after tough runs and workouts. I have used a few brands and have discovered that there is very little difference except for price. You can try Vital Proteins or really any other brand! I am convinced that these five things, although small and not done perfectly, did help me stay injury free while running some of my highest mileage ever. What are your tips to stay injury free? These are not the typical relaxing massages, lol. They HURT but they help. I have been going every two to three weeks for a couple months. Definitely noticed a difference! Great advice. Soon, I will start ramping up my training to prepare for an October half marathon and I’m concerned about injuries. How did you find the massage therapist? There are so many around. Did you ask your PT for a recommendation? My massage therapist actually worked at my PT’s office so it was super easy! I would definitely try to find someone who either works in a PT office or works regularly with athletes. Good luck! I know you use to do a lot of Pure Barre. How do you feel doing these things compare to going to those classes? I also suffer from tight calves. I usually have to get my ankles adjusted when I go to my monthly chiropractor visit. Pure barre definitely helped because it was core and stretching wrapped into a workout!! Wow, thanks for this! Love following you blog posts and Insta photos. Do you have any tips for buying a foam roller? Is it OK to go on Amazon and select one with a high rating, or should I do more research? What do you use?